0 colleges and universities in the United States, Canada, and other parts of the world. In addition, foreign born professionals frequently need a TOEFL score for certification to practice their profession in the United States or Canada. 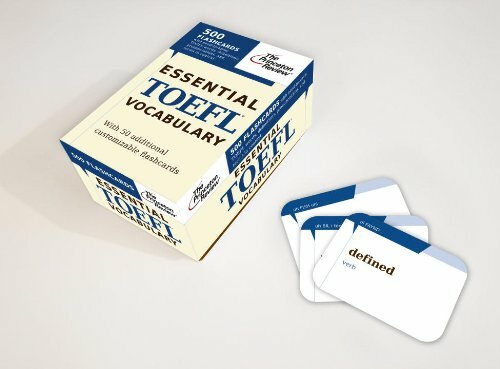 The TOEFL is a timed test that consists of the three sections listed here. WORDS TO HELP YOU BOOST YOUR TOEFL SCORE! I bougth this flashcard last month and i do like it. It is very helpfull for me. It is small card, so i can put it in pocket and i always bring it with me every where. When i have free time i just take it out from my pocket and read it. I eliminated the word that i used to know. Even though you have already known some word from this flashcard, but at least you learned some new words from it. You can learn synonyms from this flashcard, also. For example the word ” Consumed ” means: to used up or eat up . Synonyms: devoured, depleted. So you can learn two more new word from the word: consumed. You should bougth it. At least you can learn 100-200 new words from this flashcard. It is better than you don’t learn anythings.